PowerColor Radeon HD 7850 SCS3 1GB Passive Video Card Review - Legit ReviewsPassive Cooled Radeon HD 7850 - Silence? 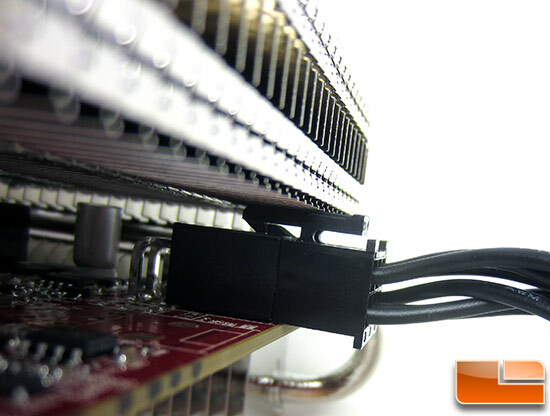 Passive Cooled Radeon HD 7850 – Silence? PowerColor has been one of the very few add-in board manufacturers that continually releases enthusiast class, silent graphics cards in the companies SCS3 (Silent Cooling System) product line. When we learned that PowerColor would be building a passive AMD Radeon HD 7850 1GB video card with stock clock speeds we were dumb founded. 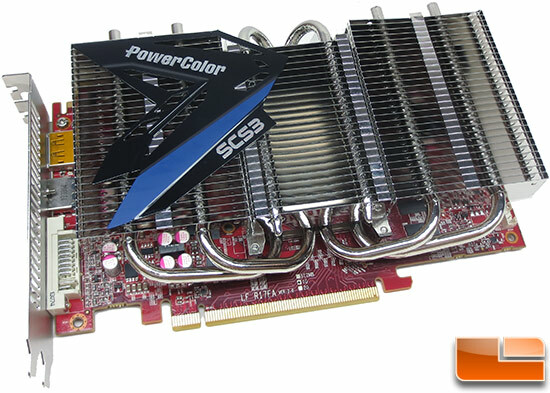 How could PowerColor built a totally silent version of this mid-level gaming graphics card? The 28nm Pitcairn Pro core has 1,024 stream processors clocked at 860MHz and 1GB GDDR5 memory at 1200MHz (4,800MHz effective). 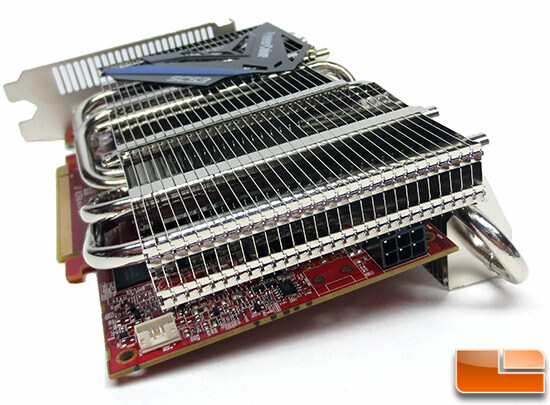 The AMD Radeon HD 7850 2GB reference card has a typical board power of around 130 Watts. It is safe to assume that the PowerColor HD 7850 SCS3 1GB would have a slightly lower TDP than that since it has half the frame buffer and no cooling fan. It is interesting to see that PowerColor didn’t downclock this card in order to make it passive, so it should perform the same as any other reference clocked Radeon HD 7850 1GB card, but without making any noise. That doesn’t sound too bad and the $219.99 Suggested Retail Price, doesn’t sound half bad either. 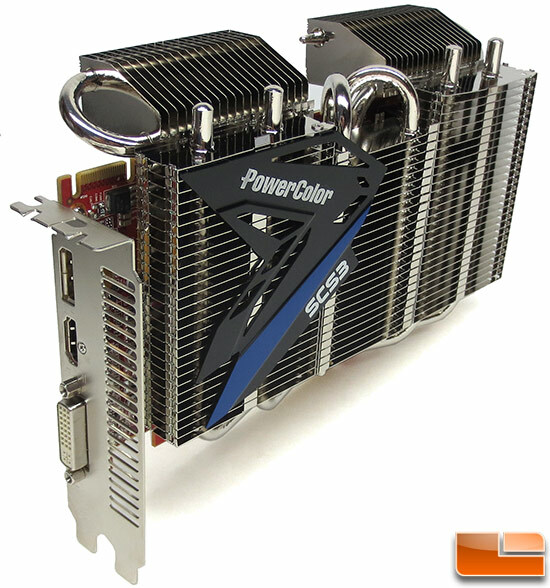 PowerColor uses a rather large aluminum finned heatsink with six heat-pipes to keep the AMD Radeon HD 7850 core running without the need for direct active cooling. The heatsink is so larger that it covers the entire front of the card and actually extends over the end and up and over the top of the PCB (Printed Circuit Board). 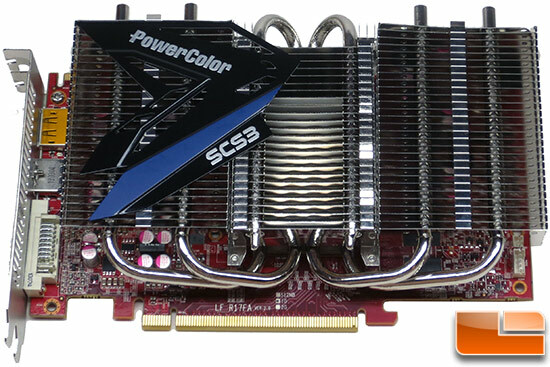 PowerColor says that this SCS3 GPU Cooler has a patented G-Shape heat-pipe design. Here is a look at the front of the PowerColor 7850 SCS3 1GB that clearly shows the cooler hangs over the right side of the PCB. When it comes to dimensions, you are looking at 8.25″ in length and nearly 5.25″ in height! On our card the 1GB of GDDR5 SGRAM is made up of SK Hynix H5GQ1H24BFR memory IC’s. 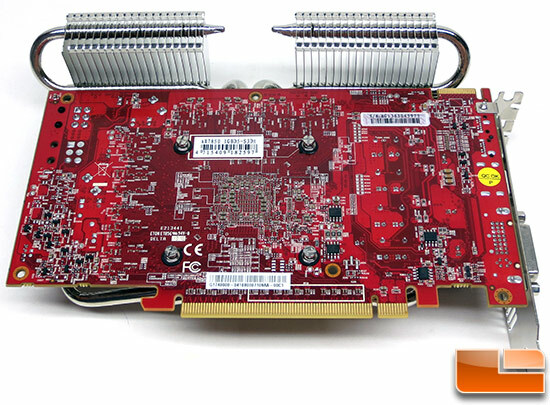 The back of the PowerColor HD 7850 SCS3 1GB GDDR5 video card shows off the red PCB and that is about it. Notice that this card has one AMD CrossFire interconnect, so it supports dual-GPU Crossfire setups. When it comes to video outputs on the PowerColor HD 7850 SCS3 1GB GDDR5 video card you have a DisplayPort 1.2, HDMI 1.4a and a Dual-Link DVI-I. 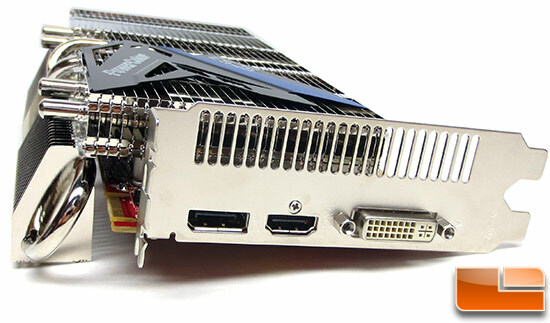 The PowerColor Radeon HD 7850 SCS3 1GB features a 6-pin PCIe power header that is located at the end of the card under the heatsink. This makes it tricky to get to, but it works. Notice that PowerColor left the 4-pin video card fan header, so if you wanted to add a GPU cooling fan down the road you have the ability to do so. PowerColor suggests that you use a 500 Watt or greater power supply with one 75W 6-pin PCie video card connector for proper operation. When we connected the 6-pin PCIe power connector to the header we noticed that it made contact with the heatsink. PowerColor didn’t leave you much room here at all, but there is just enough to ger the job done.